This is a nice and easy ATV trip. 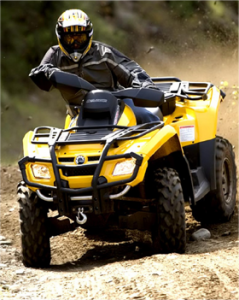 It is surprising how easily the ATVs move on versatile terrain. The speed is just right – you will be able to look around in the thick and beautiful Finnish forest, but there is also a bit of excitement in the air while driving. On the break we will relax and prepare sausages over a campfire. This safari offers you plenty of fun and excitement! You will drive on a versatile terrain in the woods to a cliff that you’re supposed to abseil from. You will wear safety harness, get a full safety guidance and a professional guide will be there to help you while you lower yourself down using a rope. This will make your adrenalin flow! One participant will abseil at a time while the others are enjoying snacks.